The hook for B10 is guard duty for a caravan of white horses in a distant land. It’s a poor hook, but things unroll afterwards in such a way that the original hook is almost meaningless. A bit more excitement about the absurd profits for selling horses to elves might get things going better, and then one could pay a homage to the rather decent Elmore Leonard novel Cuba Libre, about a horse selling cowboy getting involved in the Spanish American War. Ultimately the hook is just an excuse to get the party finds itself in a competition with a sinister organization to find the hidden homeland of an ancient race by finding lost magical tapestries. A short boat trip into the pseudo Slavic lands of Karameikos is interrupted by an ambush aided by a spy aboard the boat. The ambush is fairly well designed, and the mysterious members of the Iron Ring. A surviving party will find themselves at a dock, menaced by the dock owner’s pet cave bear, which is mourning its mistress, killed by raiders. After a night in the dockside cabin the party can head to their destination, a fortified farm, but they will discover it, at dusk, under attack by three goblin bands. The overnight siege is well designed, and looks fun to play. Afterwards the farmers are thankful for the characters’ help, but not overly so (which is nice) and discover that the attackers have stolen their horse herd. The players are encourage to set off after the herd, which is pretty reasonable given its value. Following the horses the party finds goblins massacred by other goblins and ultimately the horses in the hands of some bandits/traders. The goblin raids were bad, and the party discovers that the whole region has been ravaged, a that the brother of the farming clan leader they befriended has been kidnapped. The party is offered a greater share of the horse proceeds to save the brother, and the use of the fortified farm as a base. Assuming the adventurers accept this mission, they must discover where the goblins lair by talking to people, especially captured goblins and then do a bit of sandbox travel. There are some side adventures, seemingly entirely optional - including a band of evil pixies and a horse protecting magical creature. In general these are very solid little encounters, except for a bit of a vanilla fantasy feel. Eventually the players will raid another goblin lair, set in a magically petrified forest that deserves more attention, and discover that the captives have been moved to some ruins. The best way to find the ruins is to ask the horse spirit (that the party may have previously encountered) and kill a mother and son pair of werewolves on their behalf. Exploring the ruins on a tip received from the horse spirit the party fights more goblins and frees the captive they were seeking. Another wilderness jaunt follows the rescue as the party goes to sell their horses to some elves. Increasing numbers of slavers are encountered and the party should be developing a real antipathy towards one yellow robed wizard by this time. The horses can be sold at a few different places and if the party follows the yellow slaver wizard they will end up in a large town. In town the wizard, slavers and their local wererat allies set a decently tricky trap for the players that involves a fake fortune teller and swaggering stevedores. 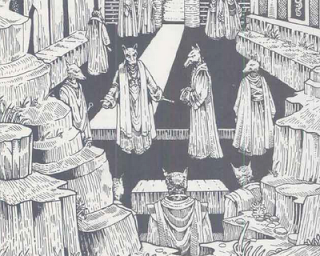 After dealing with the slavers, wererats, and a basement troll the party can head North into the lands of an ancient race, suspiciously similar to well-behaved gnolls. The mountains are also full of savage gnolls who will hound the party into a lost valley. Within the valley stands an ancient city and two warring tribes, one of brutish lizard riding humans, and one of decadent jackal headed humanoids led by a large number of priests. Both are harassed by undead from a corrupted temple. This is a basic faction war with the party holding the balance of power. Both sides can present themselves as sympathetic or awful, depending on the party’s interpretations and the truth is somewhere in the middle. Eventually the undead problem and the existence of a hunting slime monster, a former semi-divine protector of the jackal mens’ temple. The factions both want the party to help destroy the undead, and the slime monster may also need dealing with. In the end the factions will both turn on the party, which is perhaps a bit trite. 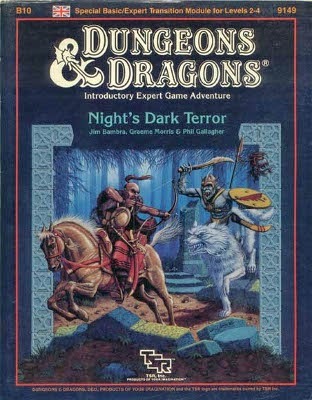 GENERALLY EXCELLENT - B10 Night’s Dark Terror is a very good module, and this extends to its usability. It has solid maps, and actual functional pull out play aids, especially a sheet for tracking weather and travel. Likewise the art is rather nice, higher quality than many modules of the era and evocative of the module’s vaguely Slavic setting. The writing is clear, box text used fairly sparingly and descriptions not overly verbose. There are a few pages of history and GM explanation in B10, but it’s matter of fact and fairly concise, relying on information building during play and NPC interaction rather than from chunks of amateur short fiction. In general the encounters in B10 are fairly tough for a party of 2-4 level, but reasonably so, and many of the random (or fixed to hex/optional sandbox) encounters are non-combat run in with strange creatures or mundane difficulties. This varied set of challenges evokes travel a lot better than the fixed encounters along narrow paths of Journey to the Rock, another B series ‘wilderness adventure’. The enemies are smart as well and the modules generally gives each encounter a few tactics to try. From the initial ambush to the various goblin siege tactics these are interesting and reasonable, even (or perhaps especially) when they aren’t absolutely the best tactics available. Likewise the NPCs and monsters are usually fairly believable in their goals and relations. The goblins fight each other over treasure for example and aren’t a monolithic force of evil, while even thankful villagers become hostile if the party decides to snoop in their bedrooms. Traps and many of the mundane treasures are pretty good, as are the use of new monsters and slight modifications to standard monsters to make them more interesting. As always in TSR products the magic items are fairly common and utterly banal. Still for a mid 80’s TSR product there’s enough flavor in B10 to make it hold up. A GOOD INTRODUCTION- B10 starts with a few pages of excellent introduction. This isn’t the space wasting pabulum of Palace of the Silver Princess, or the terrible fiction as pep talk found in DL1, its two pages of solid advice about how to make weather important in wilderness adventures and how to add replacement characters. There are other hints and bits of advice throughout, but the majority of it is interesting and useful. SUBSYSTEMS – B10 includes some nice subsystems that are important to the module, such as its use of weather effects, as well as some cool localized rules for the way specific encounters play out. The siege encounter has several nice examples of this, which various goblin tactics requiring some reasonable little rule gimmicks (like HP for doors etc). FACTIONS – B10 actually nicely uses factions and powerful creatures with their own interests. While some like the farmers and horse spirit are mere quest givers, their motivations and goals are there so that a GM can use them in the future. MINOR RAILROADS – The first hint of story making tricks comes when the party is forced to stop the night at the dock upon arrival in Karameikos. If the threat of ravening cave bear (which is reasonable, can be overcome and occurs based not only on a plot driven need) fails to keep the players from staying overnight they automatically suffer wolf attack, and then even if that fails to drive them off any attempt to move results in the party getting lost. This sort of thing is annoying and unnecessary. Another example of this is an encounter with horse thieves, who will sell the party the horses stolen by the party or inexplicably attack when the party’s NPC companion refuses to buy the horse. Now I see this as a perfect space for a player decision. Does the party buy the horses, steal them back, attack or walk off. Since this section of the adventure is just lead in to a larger sandbox, I don’t see how these choices need to be forced by the module. These sort of narrative tricks and forced decisions crop up in B10, and it’s a shame as they aren’t necessary and seem designed to make player experience of B10 follow a certain path rather than embracing its open nature and the fun of contingency. PREDESTININATION - I’m not sure what to call this exactly, but the way that certain encounters, such as the horse thieves and ultimately the party’s flight from the hidden valley are set up to turn inevitably to conflict annoys me. I think that D&D players tend to be bloody minded enough without the module ultimately forcing violence as the solution to tricky problems. It may be that the factions are covetous of any treasure the party can take from the valley, and that only the barbarian humans’ lizard mounts allow a reasonable escape, but these facts alone are enough to set up an interesting conclusion, without B10 forcing a battle. The module suffers because it wants to wrap up its sections neatly, meaning that enemies who manage to survive often 'ambush' the party before the adventure moves on to its next major area. I think this tendency to definitively finish a segment of the adventure by forcing a combat is poor design and moreover it's frustrating as it's unnecessary. ADDENDUM (A CERTAIN CREEPING BLANDNESS) - I feel bad adding this, but having thought about it for a while and read the next item in the 'B' series, B-11 King's Festival, there's a real problem in Night's Dark Terror, the problem of blandness and a lack of wonder. It's not bad in the module, and indeed there's a lot more of Dark Terror that isn't bland then is, but at some point there are elements that dilute the weird and wonderful and make the fantasy dull. The flying carpet service running out of the large town is an example of this, as is the near anthropological approach to goblins. I am torn here, because these details aren't bad, especially the goblins, but they reduce high fantasy to something boring and mundane. Evil creatures become part of a naturalistic and historical context and magical artifacts are mundane. I just don't like this kind of game, and see B10's steps in this direction the roots of a boring vanilla fantasy universe where all mystery and awesomeness is drained away. An idyllic high fantasy world where the problems are not one's of the mythic underworld intruding on the mundane world, but problems of policing. Goblins to be kept at bay, a wild dragon or two to be hunted down and the occasional mad wizard to be apprehended. I think B10 is a good adventure, and pretty well set up to run directly from the book. I would make some changes, but they’d be minor. First, I’d increase the vaguely Russian feel of the adventure, reskinning the goblins as some sort of hairy forest spirits (Leshy I guess, though they’re more gnome like). I would also make the obvious changes to the railroad like elements of the adventure, and put the conflict between the goblins and farmers onto a calendar rather than as triggered events. This way the adventure wouldn’t require the players following a particular breadcrumb trail. A few key encounters (finding the location of the ruins for example) need more than one solution and alternatives would need to be designed. Otherwise I can’t really think what to do with adventure, unless it’s reskin it and set it in pseudo pre-Spanish American war Cuba with factions of American capitalists, rebellious locals and stand-offish Spanish colonials. This would largely be making a different adventure. I have less to say about B10 then I do about some other modules, because it is a sprawling and largely successful adventure that reads more like a campaign setting then a module. I had never looked at this module before (I've more less left Basic for AD&D early and never got into the B X or other series except the intros B2 X1). But I got to play in it at NTRPG con this past week. We skipped a fair amount but still had 12 hours split across 2 sessions. It was great fun. We had a great DM, Steve Winter, which I'm sure helped. It didn't seem that railroady (only as much as needed in a convention setting. We charmed the horse thief leader and mostly were able to fool her minions until we got the jump on them (next morning), tied them up and turned them over to Pioter (sp?) for "backwoods" justice. This is the best of the old modules in my opinion. It does the same job as X1, but does it much better. I tend to agree @Scott Anderson, except there is something flat feeling about it almost like it's too big in scope and too much detailed vanilla fantasy in the beginning. I like the jackal men/short shouty guys conflict in the abandoned city the best, but it feels rather secondary to the whole, goblin raids/slaver infiltration into fantasy Russia first 2/3 of the module. It's almost as if B10 was written by three distinct authors and crudely stitched together. @Norman Harman - It would be easy to run B10 well, I just had to complain about something, and seriously the sort of "plate cleaning" episode ending railroad lite it engages in, while not the worst sin in a published module, is a terrible precedent for an introductory module. Spot-on comment about the single solution to locating Xitaqa. Wolfskull leader was able to hint at the ruined city's location being at the river-split up north. Unfortunately, a wretched encounter reaction roll with Loshad spelled doom for my players. They are now wandering the area (surprisingly near to Xitaqa) and getting attacked by the werewolves. Probably able to gain a little insight if they defeat and interrogate the wolves, but it's possible that they won't find the ruined city at all. I don't want to engineer its discovery. Them's the breaks. I guess B10 could have done more to ensure the PCs find he city, and it's probably incumbent upon the DM to remedy that - I'm just stubborn. I like your thorough review, but what you dislike as 'blandness' I see as blank canvas. OK, it's not B1 where you're having to populate everything, but essentially B10 gives a DM a terrific setting, some general undercurrents and stuff to be doing without compelling someone to memorize 75 different plotlines to ensure that all the moving parts match up everywhere. I've been doing this for a while, and I'm surprised how wedded DMs today are to the written word. Sure, there is some basic geography one hews to, but (as in the above example, where the players can't find the city) I strive to remind DMs that DM'ing is about resolving Schroedinger's cat in whatever way is the most fun, not by being loyal to the written word. If your players are wandering around, can't find something, and the "fun" is fading, then they should 'find it' wherever they happen to BE. So what if it's not where the map placed it, if it doesn't break anything else? Sure, as a DM this makes your life a little harder, rearraging the scenery as needed to suit the game, not the map you painstakingly drew the week before, but hey, tap-dancing is fun too. Took the words right out of my mouth, Styopa! Just about to finish this module as our first 5th edition campaign. Works great with 5e's return to "basics". I had this continue (nicely) from the 5e starter set's adventure (and we began the campaign before the full books were out ... so our initial characters were all cleric/fighter/magic-user/thief ... just like Basic days!). Eventually players joined or replaced their characters and I ended up placing all the action in 4th edition's Nentir Vale. Worked awesome -- a great limited area with many similarities to the Karameikos lands featured in B10 (if any want to know I'm happy to lay out for you my geographical substitutes). I love the richly textured background of the module -- a little DM work required of course ... especially when blending with the Nentir Vale setting and the preceding adventure. Pyotr and his family became very real, many political factions played out their parts, etc. The wizard Glasstaff became our Golthar and had some great getaways. The old druid from Thundertree provided a silver sickle to take on the werewolves. Dythan's Legion, a political faction in the Nentir Vale material has been a really interesting force ... and I reskinned all the Hutaakan jackal people to be dragonborn remnants of the ancient empire of Arkhosia in the Nentir Vale background. 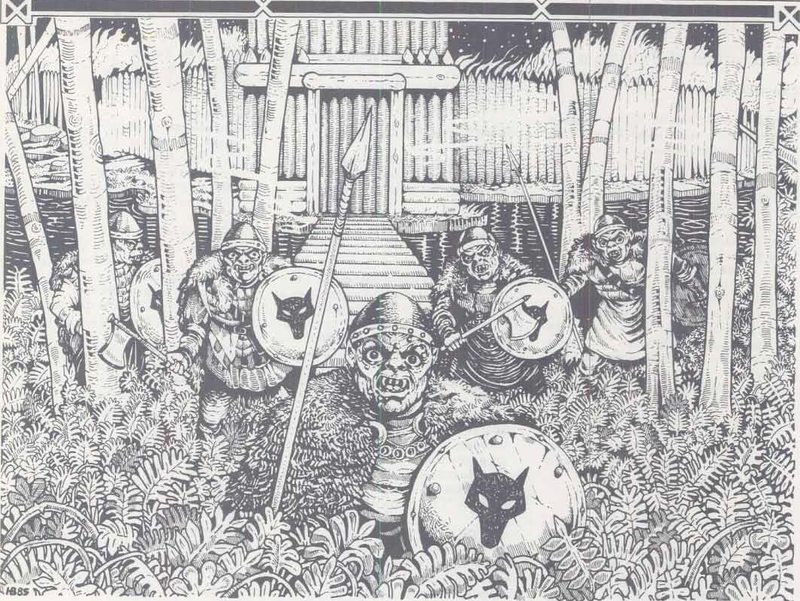 The Iron Ring was an obvious match for the Iron Circle and they moved in to the Harken area mid to late campaign. I think we have one session left! It's been about a 2 year campaign all told -- excellent! This B10 is unique among older modules -- it almost feels like an "adventure path" to me. My PCs have gone from 1st to 6th by the end with a near TPK and just a few bonus sidetreks thrown in (including a Spottle Parlor episode from Dungeon magazine!). If you prefer to e-mail me directly as opposed to spamming Gus' blog; you can get me at jlv61560 (at) yahoo (dot) com. I've been working on setting up something using Nentir Vale for a while now, and it always seems that some of the old B and X modules would work really, really well for that purpose, but I never really considered B10 as a possibility. So anything you'd care to share would be some real insight for me! is surely far from vanilla. It is mundane in the sense that space monkeys playing violins don't appear; however it uses traditional elements to great effect, and is beautifully crafted. To put it another way, Pride and Prejudice uses the plot of a Mills and Boon novel; it turns out to be so satisfying because it was written by a genius.